Oxford at Iron Horse is a Luxury Apartment Community in North Richland Hills, Texas featuring non-smoking apartment homes with beautifully-appointed amenities such as soaring nine-foot ceilings, stylish hardwood flooring, expansive garden tubs, and large walk-in closets. Located in the heart of North Richland Hills, Oxford at Iron Horse provides a convenient location to shopping, restaurants, and entertainment, but with our resort-style community features you may never want to leave the comforts of home. Residents will enjoy a sparkling swimming pool with waterfall, exclusive media room, and sand volleyball court. With ample style, conscious design, and first-rate customer service, our community has been constructed to accommodate even the most discerning resident. View our gallery, and come see what all the hype is all about at Oxford at Iron Horse Apartments in North Richland Hills. 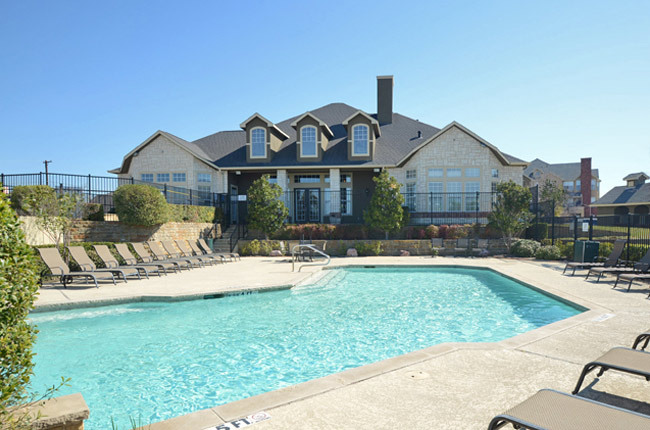 Nestled right outside of Iron Horse Golf Course, Oxford at Iron Horse provides its residents with a central location in the heart of North Richland Hills, Texas. Our community is within close proximity to Interstate 820, Interstate 35W, and Texas 121. Aside from easy commutes, we are surrounded by green space so residents can enjoy a sunny afternoon at North Park, Buffalo Ridge Park, and of course, Iron Horse Golf Course. Rufe Snow Drive serves as a boulevard of culinary delight where you can enjoy every type of meal from Mexican to Chinese. To the south of our community, residents will find a plethora of shopping at Northeast Mall, which offers stores such as Dillard’s, Chico’s, and Forever 21. The area also features a Barnes & Noble, T.J. Maxx, and Best Buy. It truly is a shopaholics dream come true. Don't wait another minute! Schedule your personalized tour of Oxford at Iron Horse today.